Named after Queen Maud of Norway, this 26,000-tonne logistics and support vessel is the first of its kind in the Royal Norwegian Navy. The fully winterised, bespoke design is based on BMT’s scalable AEGIR platform and provides global task force support from one multi-role ship, featuring helicopter flight deck and hangar, and a 48-bed hospital capability. Designed to comply with international maritime legislation, the Logistic Support Vessel design is a bespoke double hull design adapted from BMT’s AEGIR® logistic support vessel concept, and utilises Commercial Off the Shelf technologies and provides low through life costs to satisfy the requirements common to many of the world's navies. BMT's independent design skills coupled with knowledge of both military and commercial needs were combined with South Korea’s premier shipbuilder, DSME, to provide a cost-effective solution that can not only be tailored to the customers’ specific requirements, but can also allow nations to retain indigenous capabilities in ship design and engineering. 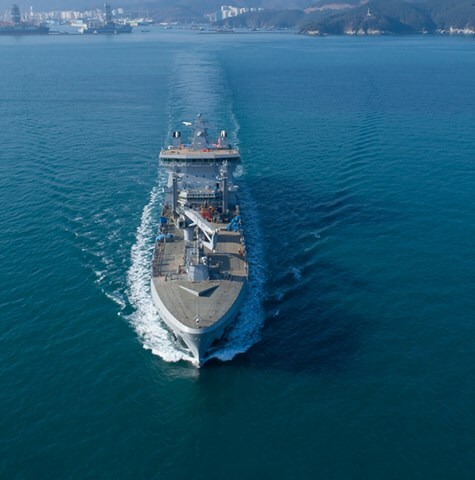 Ordered by the Norwegian Defence Materiel Agency (NDMA), this IMO-compliant vessel was designed by BMT to the specific requirements of the Royal Norwegian Navy, offering logistical support by providing fuel and fresh water to naval vessels at sea. HNoMS Maud, had first steel cut in 2014 and was accepted off contract in November 2018 ready to support the Norwegian Fleet.